Sure, it's nice to save and go on budget dates, but we women want to be treated to a fancy dinner date once in a while, don't we? So, if you're craving some romance and your man would like some steak, then make reservations at the dinnertime-only Cru Steakhouse at Marriott Hotel, Newport City Complex, and prepare to be delighted by the superb food and intimate setting. It's perfect for anniversary dinners or when you're celebrating something as a couple (his--or your--promotion, perhaps?). The interiors of Cru are dimly lit and sophisticated, with tall red booths and shelves stocked with wine. The warm ambiance of the restaurant will get you and your man in the mood for a romantic evening (at Cru and back at home). Their open kitchen allows you to watch the chefs as they prepare orders and observe how they cook your meal at the flaming grill near the dining area. Friendly waiters will sit you down and tell you about the entire menu. After you place your order, they'll immediately serve complimentary freshly baked bread that come in three varieties: Spinach Gruyere, Tomato, and Parmesan. Each platter is served with Davao goat cheese and herb butter that melts right onto the bread. It will be hard to stop yourself from eating the whole loaf because each variant tastes uniquely delicious! Normally, other restaurants only serve plain baguettes or dinner rolls, but Cru comes up with unique takes on even just their bread. This already gives you a preview of the special meal you are about to have. For your appetizer, try the Lime Marinade Tuna Avocado Tartar (P620), a dish made of fresh yellow fin tuna topped with homemade chili jam. The chili jam is sous chef Redj Casanova's (yes, his name is really Casanova, how amusingly apt!) own concoction of fresh tomatoes, bell peppers, chili, and syrup. The plate has a simple balsamic reduction on the side and is topped with yummy guacamole (avocado). If you want salad, we recommend the Baby Spinach Salad, which has a crisp parmesan basket holding the spinach greens tossed in balsamic vinaigrette. A sprinkling of walnuts, blue cheese, sweet orange segments, and red cherry tomatoes in light mustard dressing complete the refreshing starter. By now, we bet you can't wait to get to the main course! The tender Angus U.S. Rib Eye Steak is the star of the meal, and you and your man can choose which marinade you prefer. One of you can order the Cru 14 seasoning, a butter-based mixture of 14 different spices, inspired by Cafe de Paris. The other can try the Cru Spice pre-marinade, which is more Mediterranean in flavor, with touches of turmeric, cinnamon, and other exotic dry spices. Both types go well with a glass of imported red wine! 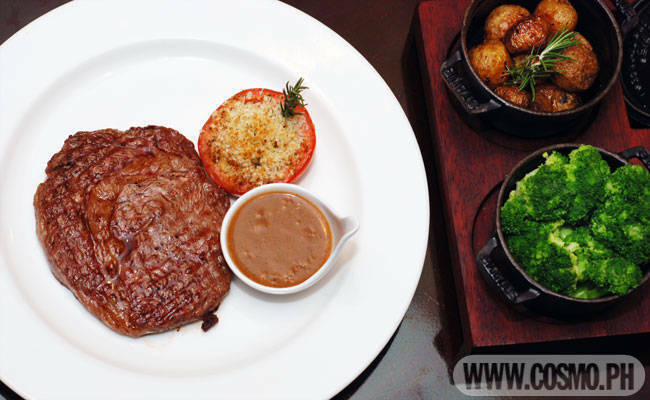 Each order of the Rib Eye Steak comes with starch and vegetable side dishes. Choose from the following starch options: Fresh Cut Fries, Potato and Onion Gratin with Mozzarella, or Oven-Roasted Marbled Potatoes. Vegetable offerings include Asparagus Stalks with Parmesan Cheese, Portobello Mushrooms with Vinegar and Fresh Herbs, or Steamed Broccoli. If each of you will get a steak, order four different side dishes so you get to try more. Even after a scrumptious, filling meal, you should always have room for dessert! Cru's New York Style Cheesecake (P340), made with graham crackers and vanilla essence, is the perfect way to end your meal. The tangy taste of cream cheese is complemented by a scoop of homemade lemon ice cream and raspberry coulis, which cleanse your palate. We swear, after wining and dining with your man at Cru, he'll love you even more! Cru's fellow in-hotel restaurant, the Marriott Cafe, is treating its patrons to 50% off the lunch buffet until October 31, as part of the hotel's second anniversary. The promo price of P950 per head already includes flowing iced tea. If your guy is more of a lunch person, this is something you both will enjoy. Sample their wide array of appetizers, soup, salad, main course, and dessert. Some highlight dishes are Stuffed Turkey, Butter Fried Prawn with Asparagus, Blue Marlin with Tomato Coulis, and Arabic Chicken. If either of you is a picky eater, opt for the Filipino, Indian, Chinese, and Mongolian stations where you can customize your meal. A well-stocked dessert station awaits you at the end of the feast! Launch the gallery to see photos of Cru Steakhouse and a sneak peek of what to expect at Marriott Cafe! Cru Steakhouse is open for dinner daily except Monday, from 6PM to 10:30PM. The Marriott Cafe anniversary promo is valid from Monday to Saturday. For inquiries or reservations, call 988-9999. Marriott Hotel Manila is located on Newport Boulevard, Newport City Complex, Pasay City.